A Danish physicist and chemist who discovered that electric currents create magnetic fields, an important aspect of electromagnetism. He shaped post-Kantian philosophy and advances in science throughout the late 19th century. He was born in Rudkøbing and as a young boy he developed his interest in science while working for his father, who owned a pharmacy. He and his brother Anders received most of their early education through self-study at home, going to Copenhagen in 1793 to take entrance exams for the University of Copenhagen, where both brothers excelled academically. By 1796 he had been awarded honors for his papers in both aesthetics and physics. He earned his doctorate in 1799 for a dissertation based on the works of Kant entitled "The Architectonicks of Natural Metaphysics". In 1801 he received a travel scholarship and public grant which enabled him to spend three years travelling across Europe. In Germany he met Johann Wilhelm Ritter, a physicist who believed there was a connection between electricity and magnetism. He believed in Kantian ideas about the unity of nature and that deep relationships existed between natural phenomena so this made sense to him. Their conversations drew him into the study of physics. He became a professor at the University of Copenhagen in 1806 and continued his research with electric currents and acoustics. Under his guidance the University developed a comprehensive physics and chemistry program and established new laboratories. In 1824, he founded Selskabet for Naturlærens Udbredelse (SNU), a society to disseminate knowledge of the natural sciences. He was also the founder of predecessor organizations which eventually became the Danish Meteorological Institute and the Danish Patent and Trademark Office. He was the first modern thinker to explicitly describe and name the thought experiment. On 21 April 1820, during a lecture, he noticed a compass needle deflected from magnetic north when an electric current from a battery was switched on and off, confirming a direct relationship between electricity and magnetism. His initial interpretation was that magnetic effects radiate from all sides of a wire carrying an electric current, as do light and heat. Three months later he began more intensive investigations and soon thereafter published his findings, showing that an electric current produces a circular magnetic field as it flows through a wire. This discovery was not due to mere chance, since he had been looking for a relation between electricity and magnetism for several years. The special symmetry of the phenomenon was possibly one of the difficulties that retarded the discovery. His findings stirred much research into electrodynamics throughout the scientific community, influencing French physicist André-Marie Ampère's developments of a single mathematical formula to represent the magnetic forces between current-carrying conductors, and his work also represented a major step toward a unified concept of energy. 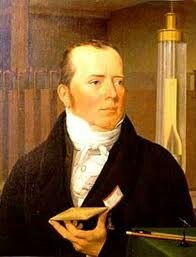 In 1825, he made a significant contribution to chemistry by producing aluminium for the first time. While an aluminium-iron alloy had previously been developed by British scientist and inventor Humphry Davy, he was the first to isolate the element via a reduction of aluminium chloride. In 1822, he was elected a foreign member of the Royal Swedish Academy of Sciences and In 1829, he founded Den Polytekniske Læreanstalt ('College of Advanced Technology') which was later renamed the Technical University of Denmark (DTU).